Episode 23, the newest bistro in Anna Nagar brings you savoury stuffed waffles cones for under INR 250… and more! This joint does delicacies across American, Italian and even Mexican cuisines but it’s their stuffed cones that are the talk of the town. The interiors of the bistro are simple, with wooden flooring and chairs and tables, but the food has a lot more to offer. 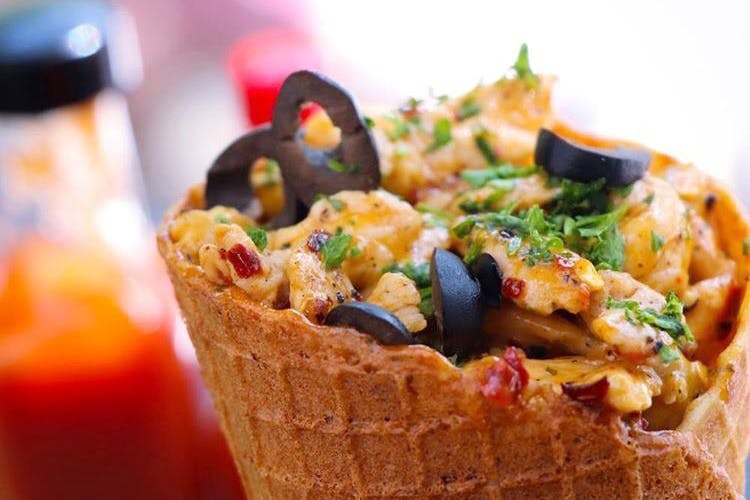 Looking similar to pizza cones, these delicious waffle are cones stuffed with heavy fillings of all kinds… From Pesto Mint Mayo Chicken to Chipotle and Schezwan Chicken, here’s what we loved digging into. A must try would be the Cesar Chicken and the Schezwan Chicken cones. This consists of tender chicken strips topped with olives, lettuce, jalapeños and creamy sauces. Apart from the cones, another dish worth trying would be their casseroles. The Sea Food Casserole is definitely our favourite pick! Among other top recommendations from the main course would be the Italian Thin Crust Pizza and the Lamb Steak. And if Mexican food is your calling, then do go ahead and try the well-cooked and cheesy Pollo Picante. Wash your meals down with Iced Milo, Nutella Shakes or Virgin Mojitos from the Beverage section. Also, for dessert, if you prefer sweet-filled cones don’t miss their mouth watering hand-crafted ice creams. These flavours are quite unique and you could experiment with flavours like the Malabar Tea or just stick to good old Choco Brownie. These are priced at INR 140.